This story was updated at 6:33 p.m. EST. Head no farther than Shenandoah National Park, where you can pick it up at the Skyland Resort. That's according to Bill Snape, senior counsel at the Center for Biological Diversity, who wants to get to the bottom of why it's sold there. "Even as we sit down for Thanksgiving dinner on Thursday, Trump wine is everywhere — how?" Snape said in an interview today. Hoping to find answers, Snape filed a request under the federal Freedom of Information Act, asking the National Park Service to provide records regarding the sale of wine and other alcoholic beverages at Shenandoah and other national parks. The request also asks NPS to produce any records or documents that mention Trump, his family members or Trump merchandise. Snape said the discovery of the wine at Shenandoah was first made by one of the center's members, who took photos of the bottles but wants to remain anonymous. "She just stumbled across it and obviously got a little fired up and upset. I checked it out and confirmed it," Snape said. Snape added that the issue raises more questions on the extent to which Trump's role as commander in chief collides with his role "as chief of the Trump empire ... with no understanding of where it begins and where it ends." "If this is the level of Trumpism at national parks, what other policy issues have that level of Trumpism?" Snape said. "It just raises a number of disturbing and intriguing conflict-of-interest issues." Jeremy Barnum, spokesman for the National Park Service, said the wine is not being sold by Shenandoah National Park, but rather by Delaware North Cos. Inc., the park's licensed concessioner. 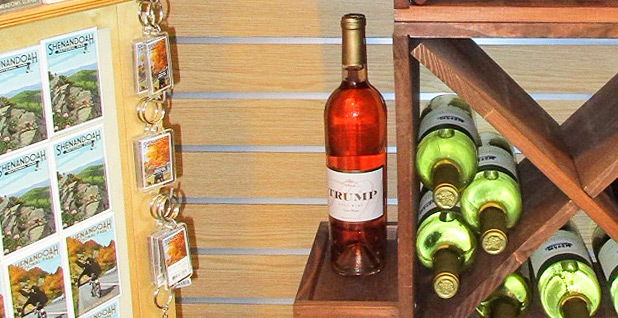 "The National Park Service authorizes concessioners to sell categories of retail goods and products like t-shirts, baseball hats, and in this case wine. However, the NPS does not specify what brands of these products should be sold," Barnum said. "The concessioner has been selling wine from the distributor of this particular winery in Virginia for years."